Emirates International Endurance Village, Al Wathba, United Arab Emirates. Saturday 24 November 2018. An unusual appearance with two races on the same day; a CEI1* 80km and a CEN 100km being the main event HH Shaikha Fatima bint Mubarak for Private Owners – Ladies Endurance Cup. The ladies race, which was first scheduled as a CEI2* but got later changed into a private owners’ race, was run under the Al Wathba conditions where the organisers have right of first refusal to buy the top three horses. This morning, the French Riding Federation announced the departure of Bénédicte Emond Bon from her position of national endurance coach. Petrified of convictions and love for his discipline of heart, like a Nicolas Hulot devoured by its principles, the Southern decided to throw in the towel, feeling helpless against the continuing excesses of his sport. 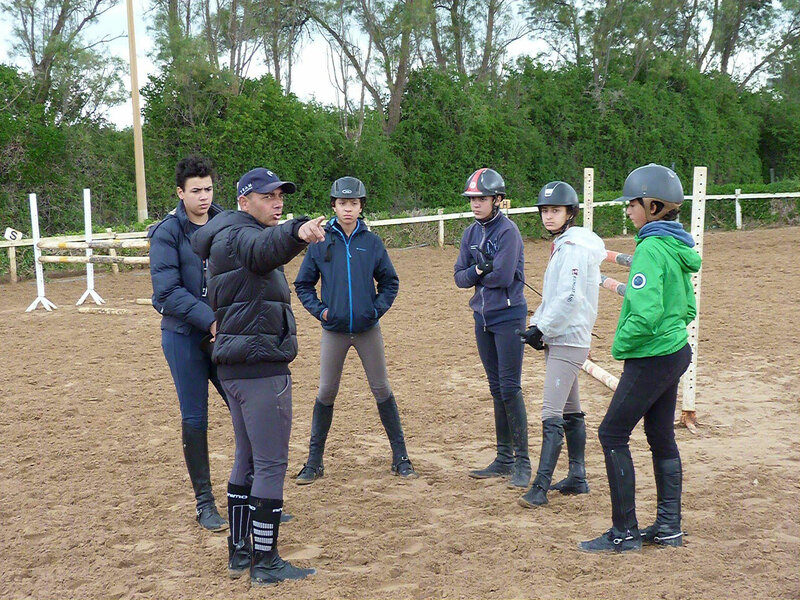 GrandPrix-Replay: What motivated you to leave your post at the French Riding Federation? Benedicte Emond Bon: Let's say that I recognize myself less and less in the discipline of high level endurance. There are many drifts that taint this sport. The straw that broke the camel's back was the scenario of the Tryon World Equestrian Equestrian Games ( read here ) ... It was beyond anything I could imagine. It was not even imaginable! This has totally demotivated me, and I do not see any solutions to the current problems. So, I feel helpless. I feel like endorsing things that I deeply dislike. GPR: So you decided to leave, even in spite of the recent declarations of the International Equestrian Federation, which has in particular launched avenues for reflection on the future of your discipline? The world governing body of equestrian sport (FEI) has given a three-month timescale for bids to host the next world championships in 2022 and has said it will accept representations from venues interested in staging standalone events as well as those who would be prepared to host all seven equestrian disciplines at once. The all-in-one format, introduced in 1990, has been known as the World Equestrian Games (WEG), but doubts were cast on its future just over two weeks ago when FEI President Ingmar de Vos stated that it may not be the best model going forward due to the enormous cost and logistical challenge to a single bidder. Mr Tom initially wanted to do it in the North Pole, but we reminded him it was a bit chilly, had no horses and didn't really go with the name. So Patagonia it is. The Institute is investigating racecourse options in the mountains, deserts, pampas and grasslands of the southern section of the Andes as we speak. The Institute of Adventure Research are in Patagonia right now meeting people, shaking hands, and gawping at the horses and scenery. Plans are being crafted right now, with an Institute-led pioneers edition penned for early 2019 and the first full edition targeted at October 2019. On September 18 and 19, 2020, Collie will host the Tom Quilty Gold Cup 160km Endurance Ride. The Tom Quilty ride is the premier event on the national calendar and the one event that every endurance rider wants to compete in. It is a test for both the horse and rider against the terrain and the elements. Horses are vetted stringently pre-ride and along the way at various checkpoints and then at the end of the ride. If all vet criteria is met the horse and rider are deemed ‘fit to continue’ and ultimately receive the coveted silver buckle for completion. Just over $US1 million was spent by the FEI on the endurance track at the 2018 FEI World Equestrian Games in Tryon, North Carolina, delegates to the FEI General Assembly in Manama, Bahrain were told on Monday during a meeting to discuss the issues surrounding the cancelled event. Findings by the independent Equestrian Community Integrity Unit (ECIU) on the issues surrounding the Endurance championships at the Games, were presented at the General Assembly, focusing on the sequence of events that took place from about 12 hours before the start of 160km competition that ultimately led to the false start on September 12. Some competitors were misdirected and officials opted to change the ride to a 120km event, before deteriorating weather forced the event’s cancellation. Andrew Smith from the ECIU detailed the underlying reasons that affected preparations for the endurance event, with the report’s findings based on information provided during interviews with several people, including key people within the Organising Committee, the FEI and other witnesses. The 2018 FEI World Equestrian Games, in Mill Spring, North Carolina, and the future of the Games were the subject of a well-attended session at the FEI General Assembly in Manama, Bahrain, today. The independent Equestrian Community Integrity Unit, which was tasked with investigating the issues surrounding the endurance championships at the Games, presented its findings on the sequence of events that took place from approximately 12 hours prior to the start of competition that ultimately led to the false start on Sept. 12. The conclusions of the report show that there was no single reason that caused the false start but multiple issues: most importantly lack of communication between officials—particularly the lack of radios—and also between the Organizing Committee, national federations and athletes, delays to the preparation of the vet gate and the endurance trail, and the decision to maintain a full schedule of events at Tryon International Equestrian Center that stretched an already under-resourced team required to deliver both these events and the Games. FEI Secretary General Sabrina Ibáñez then presented the overall conclusions, acknowledging that there were multiple factors that contributed, not just to the issues surrounding endurance but which also impacted the overall delivery of the Games. The management structure of the Organizing Committee, other construction projects and resources that were given priority over delivery of fields of play and other Games-related infrastructures, and communication of vital information in a timely manner were major contributory factors, she said. She informed delegates that the FEI invested close to $1 million on the endurance track alone, over and above other financial support provided by the FEI to the Organizing Committee to ensure the Games happened. In-keeping with good financial oversight, the FEI had made financial provisions specifically to cover emergency situations specifically related to the Games. She also acknowledged that, despite the FEI’s commitment to support the Organzing Committee, in particular during the latter stages of event preparations, the FEI had no realistic mechanism to push the Organizing Committee to deliver on its promises other than threatening to cancel the Games, which was not an option due to the time and resources that national federations and athletes had invested in preparing for the Games. Prior to opening up the meeting to questions from the floor, the Secretary General talked through the plan to open up the bidding process for individual world championships in all disciplines for 2022, but with preference being given to multi-discipline bids. Top sport (with the exception of endurance) was the key success of the Games, along with superb broadcast coverage on NBC in the home market, including 57 hours of live coverage that resulted in a record audience for equestrian sport. However, lack of venue readiness and an under-resourced Organizing Committee, both from a financial and personnel perspective, were major negatives that ultimately impacted the delivery of the Games. [Red Bank, New Jersey November 16, 2018] Heather Wallace, the Timid Rider, is a returning adult equestrian seeking to inspire and motivate others with confidence in and out of the saddle through her book, Confessions of a Timid Rider, her blog, and her social media. She is proud to announce that The Timid Rider is the official sponsor of the Best Sportsmanship Awards for the 2019 Gobi Desert Cup, taking place August 27 - September 6, 2019, in Mongolia. Every day a rider will be chosen who motivates and supports others on their journey. At the closing Awards Ceremony, an award for overall Best Sportsmanship will be presented to the rider that showed exemplary sportsman-like behavior throughout the entirety of the race. Heather joined the Gobi Desert Cup in 2018 as the Media Consultant to provide writing and photography. She loved every moment and is further inspired to help others pursue their passions and test their limits. During her time with the event, she challenged herself to sleep on the ground, take camp showers, eat exotic food, and even race a Mongolian horse in the Officials Race! As a proud part of the official Gobi Desert Cup team, Heather is pleased to share each rider’s journey in the worldwide press as well as sponsor an award that is so important to her mission. Heather Wallace is a returning adult equestrian struggling with confidence in the saddle. She left riding due to anxiety as a teenager and returned as an adult after having her first child with no less tension, but the determination to pursue her passion and time to herself. Follow Heather’s journey on The Timid Rider while she struggles to let passion be greater than her fear. Co-founded in 2017 by FEI 3* Endurance Rider, Camille Champagne, the Gobi Desert Cup is a 480-kilometer multi-stage endurance race through the Gobi Desert, riding Mongolian horses every day for six days over 50 miles. This challenge is the only one of its kind to combine endurance while positively supporting Mongolian nomadic culture and their horses before, during, and after the event. Preference would be given to multi-discipline bids for 2022, the FEI said, while dressage and para-dressage should be combined. The decision insisting on a single host for dressage, driving, endurance, eventing, jumping, reining, vaulting and para-dressage did not come as a surprise after two of eight WEGs required venue changes–1998 and 2018–when organizers did not have funding and no organizer came forward for 2022. Waikato student Elise Stables' decision to take a year off to travel will lead her on an adventure through the toughest horse race in the world. Stables has been selected as the youngest New Zealander to ride in the Mongol Derby, a challenge she'll have almost a year to prepare for. Riders cover 1000km of Mongolian wilderness on semi-wild horses, changing steed every 40km. In early 2011, few in Tunisia had a real, tangible interest in equestrian sports, with the number of licensed riders idling at barely 200. The upsurge in public interest has been brought about in no small part thanks to Maher Berrachid, President of the Tunisian Equestrian Federation (FTSE). Maher had clear ideas on what was holding back the sport in Tunisia and how these obstacles could be surmounted. With Tunisia itself undergoing a significant political shift in 2011, the FTSE shed its previous designation as a military federation to become one overseen by the Ministry of Sport, giving it a wider scope for self-governance and the implementation of its own strategic plan. FTSE has since overseen a near-complete revamp of the processes that govern it and the way it structures the sport. “Before 2011, there weren’t any real objectives for the sport in Tunisia. No national training, no long-term perspective, but from the moment we focused our objectives on an international level and implemented a calendar, interest grew very rapidly,” says Berrachid. The 2018/19 Endurance season in the UNited Arab Emirates has barely begun and already two horses have been listed as dead on the FEI Database. In the CEI 80km in Dubai today (7th November) two horses, namely HENHAM FEATHERSTONE (UAE) (FEI Reg 105JJ43) who is a 10 year old gelding originally from South Africa and DENELDAN SHANARY (UAE) (FEI Reg 105SS86), a 10 year old gelding originally from Australia, were listed on the provisional results information available from official scorers Tawqeet, as eliminated for minor injury (MI) but both horses were then listed as deceased within hours on the FEI Database (see images). The FEI, quite understandably, has flagged up the nearly clean sheet achieved in the extensive sampling carried out at Tryon, save for two endurance horses. The Equine Anti-Doping and Controlled Medication Programme always goes into overdrive at WEGs and Olympic Games, when so many major players are assembled in one place. The 2018 WEG was no exception; 163 horses were sampled out of (according to other official blurb) 820 participants. That’s a sampling rate of 19.88% of horses present, five times greater than the percentage usually targeted at non-championship fixtures. “Enhanced” anti-doping measures were rolled out before Tryon, with national federations offered pre-arrival testing and elective testing to ensure horses were clean. The FEI also launched a guide in eight languages. Naturally, the FEI is pleased the message sunk home, and the results provide another feel-good story to counter all the negative press about Tryon. A two-day series of equestrian endurance races for young people starts at the Boudheib International Endurance Village on Tuesday. Equestrian Club Silin, Iatski, Ukraine. Sunday 28 October 2018. An outstanding event was held in equestrian club Silin, – a FEI ride. The athletes and their horses were competing in three distances: CEI1* 80, CEI2* 120 and first time in Ukraine CEI3* 160. There were riders not only from Ukraine, but also from Belarus and Lithuania. Salto del laja place – Bio-Bio, Chile. Saturday 27 October 2018. Last weekend the Bio-bio cup was celebrated near to Salto del laja place. This is a special event because the competition took place in the south of Chile. Usually the endurance races are held in the central zone of the country and most of the time through famous vineyards. Yet Bio-Bio is different; a beautiful district where woods are the main scenario. Riders love this place because of the flat tracks, an excellent condition for the horses, and easy to measure good speeds. However this time everybody was surprised. Following the FEI recommendations the competition was quite different from last ones. The track was much more complicated, with a lot of variation in surface types. Deep sand and also the weather were big influencers too to make it harder for the riders.